The Green Custard apple variety was originally grown by the nurseryman J. Cheal & Sons of Crawley and received in 1941. It is currently cultivated as part of Brighton Permaculture Trust’s National Collection in Stanmer Park, Brighton. 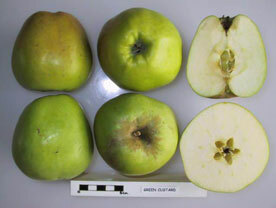 The Green Custard is a large apple that is tall to conic in shape and ribbed on the body of the fruit and on the eye. The skin is yellowish-green sometimes with faint orange flush and russet on the base. Greasy. Soft white to cream flesh that is slightly acid. The variety is very similar to Catshead. The fruit often falls early, so it should be picked in late August and stored until October.